Jypyä Pop (Turku, Finland) on 22 January 2019 in Lifestyle & Culture and Portfolio. Il doit avoir froid aux pattes. @Martine Girard: Maybe they are a bit. We're not long outside. @yoshimiparis: Thank you. Leevi do not like that gardigan, but sometimes we use it. Il s'est bien préparé pour affronter le froid. @Marcel P.: True. He is careful cat. I think that Leevi now prefer to stay inside by the hot stove. @Dreams come true: Leevi goes beside or on the radiator when we go inside. I do not want to hurry !! Aw!! His tail is up and stiff ! Must be feeling really cold ! What a cute image here ! @Devi: He's always upright There were a few degrees of frost outside, but Leevi still wanted to get out. Pretty soon it wanted back in. hahah trop beau Leevi ! Looks like Leevi is enjoying the stroll in the snow! 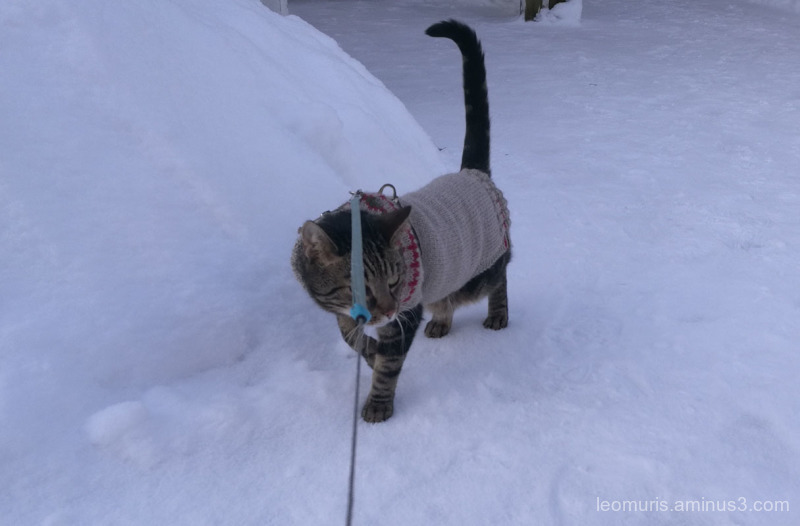 I am happy to see Leevi has his warm sweater on for his outdoor adventures. Give him a nice pat from me. @Ruthiebear: Leevi sent best regards to You. @Graciel·la (Vic. Catalonia): It just goes around. Cat keeps warmer than cold. Ohhh joli Leevi, très chic avec son petit manteau. :-) ...Superb ...and great title ...! Leevi must take his time and check things out in spite of the cold. I like his sweater. @Nina: Thank ypou. Leevi is happy now. I like his sweater. Wish I could see what Rocky would do in the snow. @B. Thomas: Thank you. It has been done by Ursulakatariina. Rockyller could have a big thrill playing in the snow.